Working with XUK will change your life. Here are 10 reasons why we think you'll love being part of the XUK family! XUK is owned by brother’s Richard and Nick Bernstein. Richard and Nick have a hands on approach and will get to know you throughout your time with us… Our employees mean the world to us! Whether it’s your first time working at a camp or your fifth, you will come away from XUK with new or improved skills including time management, leadership and the ability to work with a team from a diverse range of backgrounds. No matter what your position is within XUK, you will have a brilliant support team around you. One of the many strengths of being part of a large team is the wealth of ideas and creativity everyone around you has! Our wonderful campers come from every corner of the globe from Spain to Saudi Arabia and Taiwan to Turkmenistan. Each and every camper will look up to you as an inspiration and will love taking part in your activities, English lessons and swimming lessons! At the end of the day, nothing is more rewarding than putting a smile on a campers face! We cannot stress how much we value your feedback, before during and after camp! Whether you need a piece of equipment to run a new activity or have a suggestion about how we can make our camps even better, we will always listen to what you have to say! Every year we see team members take on new roles within our camps. We will always encourage you to see your potential, allowing you to take on further responsibilities. We host our residential camps at some of the UK’s most beautiful boarding schools with first class facilities from an onsite adventure centre to a 500 seat theatre! 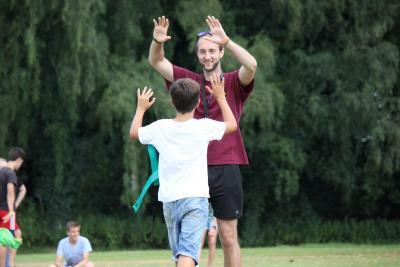 Our London day camp is run at Brookland School, in the leafy Hampstead Garden Suburb. With lots of outdoor space, this is a real rarity for London! One thing we all have in common for sure is a love and passion for working with children. Whilst having fun and being a big kid yourself from time to time, you can get paid too! If you work at one of our residential camps, we will take care of your food and accommodation too! The saying goes “The happiest place on earth is Disneyland”. We might be a little bit bias but we think it’s camp! After an Easter or summer season working in a bubble, going back to the ‘real world’ will have very little appeal! At the end of each summer we ask our staff for feedback - so many say the hardest part of the job is going home at the end! From the moment you arrive until the moment you go home, you will be making memories that will stay with you for the rest of your life! Friendships made at camp are very special, although you might live miles apart from your closest camp friends, you’ll always be counting down the days until your next reunion! The camp offered the experience I was looking for with a broad age range. It gave me the right amount of responsibility for a first year on a summer camp, and allowed me to share my knowledge in sports. The idea of working with a variety of children from all around the world was really appealing to me as it would only improve my skills further!